Exactly three years ago, I was in El Ganso, just past Léon on the Camino Francés. If I close my eyes, I can still smell cut grass on the warm evening air, and the sprig of lavender on my pillow as I drifted into sleep in a mercifully snore-free albergue. I can hear the dog’s bark ringing across the field below the town, reminding me that some creatures were working while I rested. Most of all, I remember the contentment and internal quiet I felt in that town at the end of a tough and sometimes confusing day. 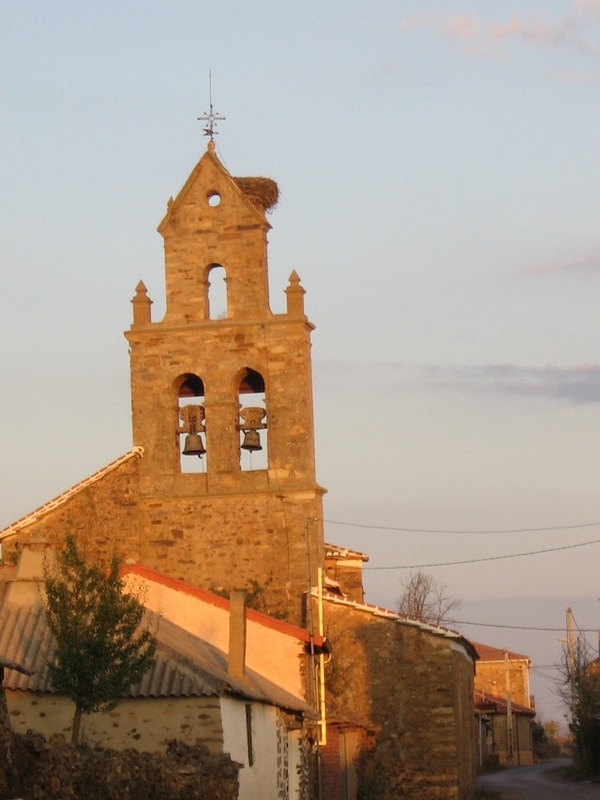 If you’ve read Sinning Across Spain, you may recall the story of Domingo, the old gentleman, or gentle old man, I met there. With all my heart, I hope he is still alive and well, and that he and his town have not been too much troubled by the economic crisis. I hope one day that I might return to thank him for the gifts he gave me. And gratitude must be given. Gracias, Domingo. Gracias, mi compañero. 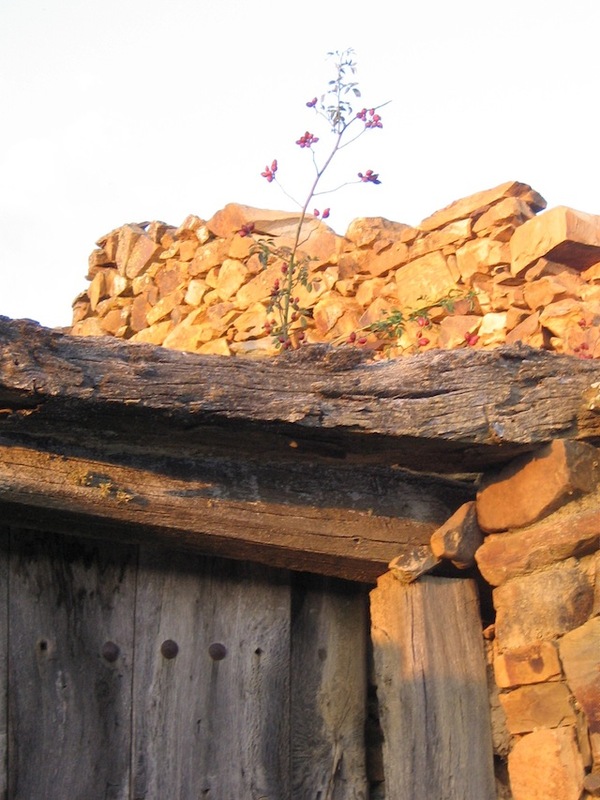 At the end of a long hot day’s walking, I’d arrived in El Ganso, a pueblo my guidebook called “hauntingly crumbling”. It was dozing, and yes, perhaps a touch melancholy, with its Cowboy Bar at the entrance decorated in saddles and cowskins. El Ganso means “wild goose”. I didn’t chase any. I wandered out of the albergue as the sun flirted with the horizon. A lone dog barked and a bird fluttered among the beams of an abandoned adobe building behind me. To my left was the handful of houses that made up the town. To my right was the road out. Opposite was a narrow dirt lane between two tumbledown buildings, and walking towards me up that lane was a man with broad, open features. His eyes were surrounded by deep lines. He leaned on a walking stick and waved with his free hand. “Buenas tardes, peregrina,” he called, his face creasing into a grin. That smile was my introduction to Domingo. We stood in the main street, talking about the weather, how far I’d walked, and where I was from. Australia got a good response. He held out his free arm and suggested a little walk–un camino pequeno. We set off at Domingo pace, stopping to sniff the wind, to look and listen. He gave me the grand tour of El Ganso, where he had spent his entire life. We saw the houses of his brothers and sisters; a big two-storey house–not so nice as the low ones; the vacant land, just waiting for a nice lady from Australia to buy it and build a new home; the abandoned houses, falling into disrepair and back into the ground; the edible rose hips; and the scratching chooks with their scrawny chicks. Then he took me to his house and ushered me inside. He showed me his kitchen, and the kettle his wife favoured, their bedroom and bathroom, both modern and cool; the guest room–for next visit? Then his shed, with its tools and folding garden furniture. 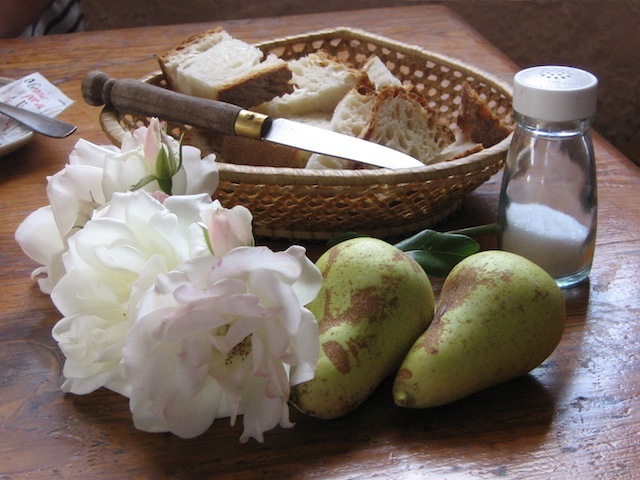 His backyard, where he picked for me white roses tinged with softest pink, and two perfect pears. He had sons in Seattle and Madrid, he told me. They made a lot of money but they didn’t come home much. “Te gusta mi pueblo?” You like my town? I watched him walk away, the scent of pears and roses wafting in the warm air as the church steeple turned orange. All around his retreating figure, the stones of the houses glowed. His home was radiant, radiating. I saw how full it was of loves and losses, and how much richer I was for him having stepped into my life to tell me of them. I took my fruits and flowers to adorn my table at the Cowboy Bar. Cowboys were a disappearing breed, and I wondered about the future of those pueblos. Would they survive the rush of the young to the cities and beyond? No need to apologise Ailsa. What a nice idea to take us back into a book we’ve read, a place we’ve kind of been to. Hope you do it again and of course with added commentary and actual photos it is makes it slightly different, another view. Welcome, Irene, and thanks for saying that. I worried I was being a bit indulgent, but all the news from Spain makes me so anxious for the people who were so very very kind to me, and the three year anniversary felt important. Those fleeting meetings impacted on me profoundly. There is no question that random acts of Spanish kindness marked all my travels there. Anyway, thanks for the feedback. I’m glad you found it interesting. I feel a bit teary reading about the old man again. I so loved Sinning across Spain. I’ve given the book to my yoga teacher to read and she is loving it. ABC TV on Tuesday night at 8.30 presently have Rick Stein’s Spain. Although it’s about the food of regions he also covers some history. Really stunning photography. Thank you for the treasured messages I’m receiving. Thanks for responding, and I’m glad it moved you to revisit Domingo. I never cease to be amazed at how much his actions meant to me, and I think of him constantly when I hear of what is currently happening in Spain. It must be harder and harder, as their young people leave the country in search of work, and families get separated. I watched Rick Stein last night, and thought of Domingo and so many of my other camino inspirations, when Rick commented on how important the family is to the Spanish. Hard days. Thanks so much for passing on the book. I know I have said it before, but it means a great deal when my writing is gifted on. I’m very grateful. I think it makes the story more real in the imagination when you see a few pictures of the terrain traveled and villages visited. When I was reading his novel I would often Google search images of the places he mentioned as he walked through them in the book. Oddly enough,I only read that book a few years ago,even though I had met Paulo (and chatted with him at a table,not really knowing who he was at the time) at the Brisbane Writer’s Festival in 1998,before he was such a huge success. at the BWF,and it bored me to tears reading it. I didn’t read another book of his for at least a decade after that one. But I have read quite a few since. I enjoyed “The Pilgrimage”,even if a lot of the book took place in Paulo’s imagination,more than in real life. In fact,I bought your book about the Camino only because I had enjoyed Paulo’s book so much. It’s interesting, your comment regarding the pictures. We talked about using them in the book, but my publishers felt that it might undermine the descriptive quality of the writing – and also that it’s good for people to be able to imagine the places, if the writing can evoke them. Hopefully it does, but I also know that sometimes there is pleasure in seeing the real places. It’s why I often pop up a photo on the Facebook page – just to give people a sense of whether what they imagined is real or not. There are more photos in the albums on that Facebook page if you are ever curious, and I’m told you don’t have to be signed in as a Facebook person to see my page, as it is a business entry, and not a personal one. There! This Luddite is still learning! Yes, he was the first book about the camino, I think. Maybe not, but certainly the first to my knowledge. I actually loved the Bunuel film called The Milky Way. Crazy and wild – just the way we want film to be! But I’m very grateful Sen Coelho brought you to Byron, and my book, and this village of mine. Thanks again for your observations – and I am hoping to get to the cinema tomorrow night to spot that GRUMPY sign! I think your publishers were right about not using pictures for your book,because your writing is so wonderfully descriptive. And there’s nothing to stop people Googling the images of those places and taking a peek on their computer screens if they want to see what it is like looking at those villages that you journeyed through. I don’t have,or want a Facebook account,but it is good to know that people without one can see the pictures if they want to. I haven’t seen or heard of the Bunuel film called The Milky Way,so I’ll have to keep an eye out for that one. “Beasts of the Southern Wild”. I’ll have to see it on the weekend,as tomorrow I’ve bought tickets for my son and I to see “Magical Mystery Tour”,which is only on for the one day. And I saw the movie “Bait 3-D” on Sunday (if you want to see some bad acting that is so bad it is hilarious…that’s you’re movie.It’s a shame too,because it was filmed on the Gold Coast…which makes it embarrassing,as well) ,so I don’t want to be spending too much time (and money) at the cinema. I saw “Beasts of the Southern Wild” today.It’s worth a look. The little girl who plays the main character is a very good actress for her age,and that would be worth the admission price alone,even if you didn’t like the movie. I can’t believe that the movie is screening five minutes from home and I still have not been able to find time to get there. I seem to be constantly playing catch-up just now. Glad to hear that both thumbs went up. That would have got a laurel wreath in times past, wouldn’t it? I will hope to get there in the next week, before the little girl is grandmother! This was a beautiful post Aisla – thank you. It has left me quite teary actually.. such love and loss. Beautiful. And the roses and pears. Thanks. I’m so touched that Domingo’s story moved you over again. He was a beautiful man. And yes, those pears and roses. You can smell them, can’t you? Thanks for responding. If only I can get back there in the coming years to tell him that people on the other side of the world loved his town!